TERA is one of the most popular MMORPG games out there, especially considering that unlike other top MMOs, it’s free to play! That being said, as with every popular game out there, especially when talking about MMOs, there are a ton of reasons for which you can get banned for, ranging from real money trading to using bots or sharing your accounts. So, before we get to the actual TERA unban appeal, let’s first see what can get you banned from TERA! What can get you banned from TERA? As a TL;DR directly from TERA’s rules of conduct, in order to not get banned from TERA, you need to play fair and respect other players. gambling – unlike other games, you can get banned from TERA if you gamble for gold. That being said, let’s go over what probably is the most asked question in regards to a TERA account ban. Can you get unbanned from TERA? Yes, you can, although it goes without saying that not everyone will be unbanned from TERA. Despite the ban reason, timing or anything else, each case is pretty unique, so a player can sometimes get unbanned from TERA for a certain offense that can be deemed lesser than a player that doesn’t get unbanned. Whether or not your TERA account will be unbanned is ultimately up to the GM that’s reviewing the appeal, and thus, there’s no way of estimating the percentages or chances or how it’s going to go beforehand. With that in mind, let’s get to the most important step! 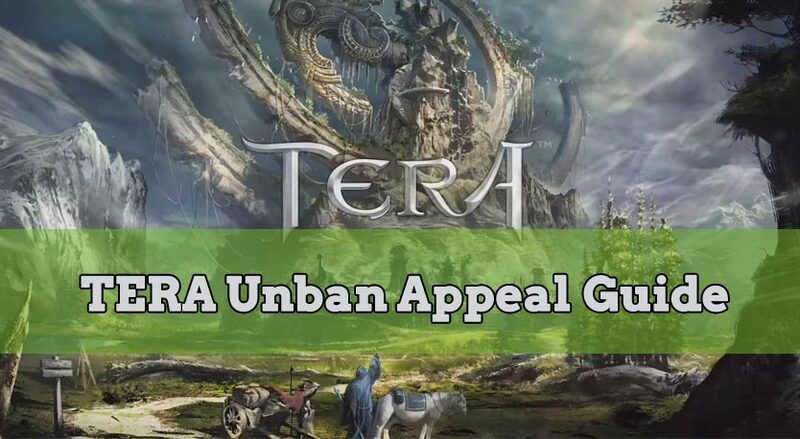 How to submit a TERA unban appeal? 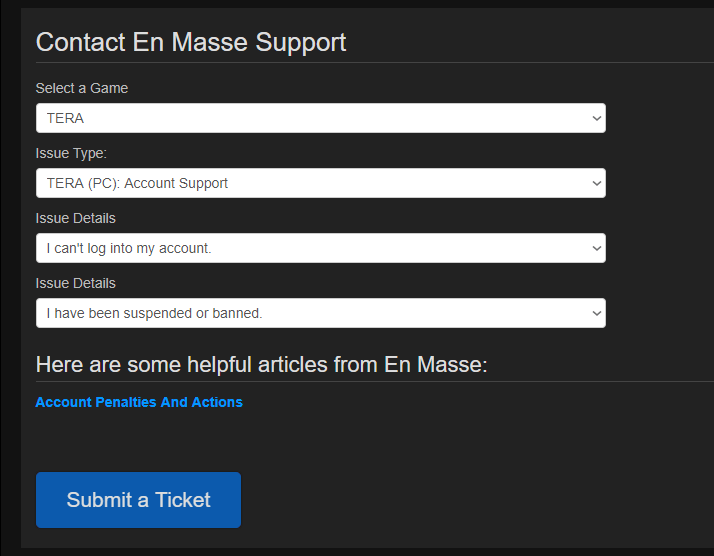 In order to submit your unban appeal to get unbanned from TERA, you first need to go on the En Masse’s Support website for TERA right here. 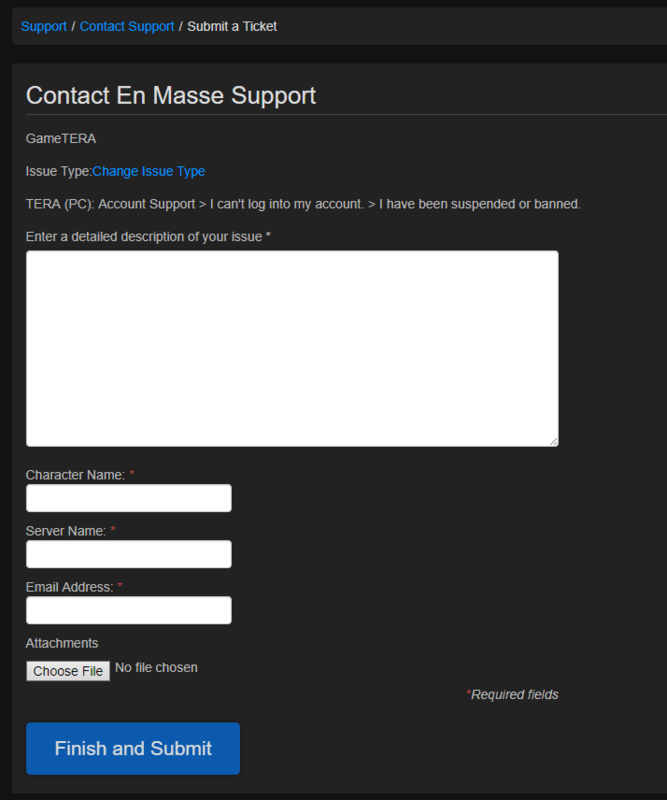 Once you’re on it, log into your TERA account, then click on the third blue button, Contact Support. and lastly, for the issue subcategory, select I have been suspended or banned. After all of the above is done, press the blue “Submit a Ticket” button. This will take us to the final and most important form in order to get your TERA account unbanned, namely the actual TERA ban appeal! So, let’s see how to complete the TERA unban appeal. and, for the last and most vital part, namely the Description field, that’s where we come in handy, should you require our professional and customized TERA unban service designed to get you unbanned from TERA. Once all of that is done, simply press the “Finish and Submit” button underneath the TERA ban appeal, and your ticket will be sent to Support. You’ll receive their answer via mail, the one you’ve put in the TERA account unban form, so make sure to keep an eye on it, as well as on the Spam folder! Need help with a banned TERA account? We're here to give you the best help in order to get your TERA account unbanned!